We had just finished our appetizers at Unconventional Diner when a nearby table was presented with a celebratory cake spewing forth sparklers from the center. Adding to the drama, the lights in the entire restaurant dimmed. A very nice touch, I thought. Diners clapped at the spectacle, and waited for the staff to resume normal service. Instead, the restaurant stayed dark, and it became apparent that the lowering of the lights was an unfortunate, but well-timed, power outage. The minutes ticked away. There were assurances from staff that someone from the Convention Center, to which the restaurant is attached, was on their way to facilitate the repair. I assessed the mood of my friends. The gleeful afterglow, resulting from several dishes that impressed us with their vibrant flavors, was starting to dissipate. “Should we leave?” asked one of my friends. Executive chef/owner David Deshaies, who was formerly executive chef and is still partner at Michel Richard’s Central, was huddled with his staff. There was little activity in the darkened kitchen. My heart sank. 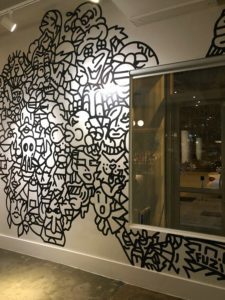 Unconventional Diner, one of DC’s newest restaurants, is already making waves in Shaw. My social media is filled with tantalizing photos and accompanying superlatives. 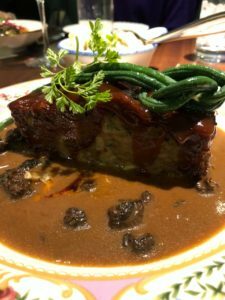 Departing the restaurant before tasting Deshaies’ widely praised meatloaf is unthinkable to me. The menu offerings at Unconventional Diner are an eclectic mix of cuisines, spanning the globe. The French chef incorporates the flavors of his country, along with dishes incorporating Asian and Latin accents. Diner food is embraced through fries, fish sticks, pot pie poppers, corn bread muffins, fried chicken, chicken parm, and meatloaf. Notably, there is a healthy dose of vegetarian offerings. Nearly every dish features a surprising twist, with adventurous sauces and kicked-up preparations. 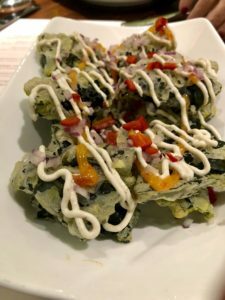 Our unconventional path commences with kale nachos – crisp green chips topped with red pepper jelly, red onion, and a swiggle of cumin yogurt. The snack, as it’s labelled on the menu, is lively and alluring. Spring rolls filled with shiitake mushrooms induce a declaration from one of my friends as being “the best she has ever had.” Why, I ask? “They are hot, and crisp, and the mushrooms are just so delicious,” she exclaims. 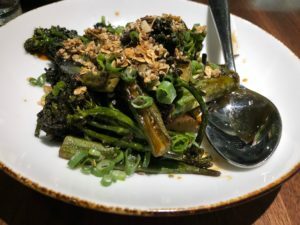 On the “shareable” side of the menu, stir fried okra and broccolini are enlivened by fermented chili with flax seed crunch for texture. It’s time for another declaration, this time by me. “My favorite dish in recent memory,” I exclaim. You don’t see okra on menus all that often, and it’s a refreshing change. What you do see on menus incessantly is roasted cauliflower. Here it shines with an appealing pairing of chickpeas, tahini, and green apples. The lights are restored somewhere between 20 to 30 minutes after the outage. Guests are treated to champagne as the kitchen reboots. Our food is delivered soon after the power is restored, much to everyone’s delight and my profound relief. If the word “diner” has you salivating for matzah ball soup, you’re in luck. The Unconvention Diner version is an herbaceous bowl of fluffy scallion matzah balls with alphabet noodles, swimming in a rich broth. And the meatloaf…. is it worth the wait? It seems strange to get excited about meatloaf, but this slab of ground meat serves as a reminder that food doesn’t have to be fancy to be electrifying. Pork, beef, veal, Gruyere, vegetables, sriracha ketchup, and mushroom gravy are a magical combination, with notes of tangy, sweet, and a touch of heat. Mashed potatoes are an expected, and absolutely necessary, accompaniment. 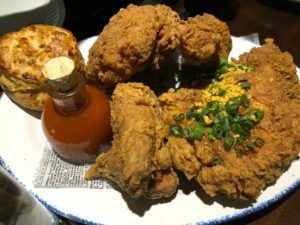 Unconventional Diner keeps its fried chicken more conventional, and that’s a positive thing. Crispy skin and juicy meat, a savory cheddar chive biscuit, and a bottle of hot sauce- it really doesn’t get any better than this. Plus, it’s well-priced at $23. Most dishes in the “supper” category of the menu range from $16 to $27, making dinner here a reasonable venture. Desserts at Unconventional Diner are the work of David Deshaies’ wife Ana. 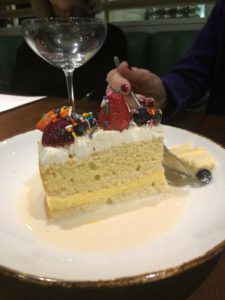 Tres leche cake with passion fruit filling is moist and buttery, with a fruit topping providing a good excuse to dive in for more. Chocolate cake is insanely rich, with layers of thick frosting surrounding the velvety cake. Its as addictive as cake can be. The pastry chef shows off her talents during breakfast and lunch at the diner as well, with an “everything” croissant among the delicacies offered. It’s on my to-do list with a double star. The menu isn’t the only thing at Unconventional Diner taking a creative turn. The walls are filled with quirky displays of art, adding to the enjoyment. Unconventional Diner is the restaurant from which I walk away and immediately make a reservation for a return visit. While a darkened restaurant requires us to take a pause in our dining, the powerful flavors are what really make an impression.